I caught up with the father of Texas 2019 DB target, Tyler Owens (Plano East). I plan on speaking to him more extensively later this week but I wanted to give you a couple of initial updates. ***Owens will make a return visit to Texas for the USC game in September. ***Following the USC game, Tyler says he plans to announce a decision. He said he’s looking at a late September or early October decision. There hasn’t been too much Texas recruiting news as the Longhorns begin their 2018 season this weekend. I caught up with their top CB commit in Grayson (GA) Kenyatta Watson to get the latest on his current commitment status. He took his Texas official visit back in April prior to him making a commitment in May. He told me that he and his family will be back in Austin for the USC game on September 15th. He also let me know that there are still schools that have still been trying to contact him. Tennessee, Washington, Baylor, and Florida State are the main schools trying to contact. When I asked if he was talking to those schools and if there was any chance that he takes a visit, Watson shot that down. Telling me “No chance, I’m 1000% Texas”. Freshman LB Ayodele Adeoye (knee) and freshman DB DeMarvion Overshown (knee) will miss Saturday’s game against Maryland. In addition, senior WR John Burt (foot) will not play. Texas seemed to dodge the injury bug in the most part during fall camp. Injuries are going to happen, but the Longhorns didn’t lose anyone to season-ending injuries. There is one position where injuries are a pretty big concern, and that’s at linebacker. Texas lost LB’s Edwin Freeman (transfer) and Demarco Boyd (offseason arrest) prior to fall camp. So Texas was a little bit thinner than expected as camp began. Then freshman Ayodele Adeoye went down with a knee injury. That injury played a role in Tom Herman and Todd Orlando moving fellow freshman DeMarvion Overshown from DB to LB. During his first scrimmage at LB, Overshown also went down with a knee injury. Both of the freshmen are out week 1 at Maryland. Junior Jeffrey McCulloch suffered a triceps injury early in fall camp. Todd Orlando said yesterday that he is a game-time decision for the Maryland game. McCulloch hasn’t fully practiced with the team in weeks. So that leaves Gary Johnson, Anthony Wheeler, Malcolm Roach, and freshman Joseph Ossai as the main guys I’d expect to see vs Maryland. There’s one other issue, Anthony Wheeler is suspended for the first half of the game. He was ejected in Texas’ bowl win vs Missouri in the 3rd quarter for targeting. So how will things look on Saturday? A lot weighs on Jeffrey McCulloch playing. If he does, he’s likely the starter at MLB with Gary Johnson and Malcolm Roach outside. If McCulloch can’t play, expect to see Johnson slide in the middle. With Roach and Joseph Ossai starting on the outside. I’d also expect Texas to go to their “lightning package” where only two LB’s are on the field at a time. The one piece of good news about this is that the injury issues are under Todd Orlando’s specific position group. So I’ll trust one of the best defensive minds in college football to figure it all out. ***When asked if Fenves (President) or Del Conte (AD) had spoken to him about it, Herman said: “We’ve had some conversations”. ***When asked if there were potential NCAA infractions involved and if he cared to speak on it, Coach Herman said: “No, not until the NCAA asks me too”. ***Mood was great at practice…guys have been flying around, happy, energetic, extremely happy to go play a football game. ***Dicker is the kicker as we had reported previously through our sourced notes. ***Getting in a routine was big for this team. Monday’s off throughout the season. Fully transitioned into the routine for the season. ***A lot of freshmen will play. Talking about their nerves, “Nervousness is an energy, it’s an excitement and if channeled properly, you can use that to your advantage. When you’re not prepared, that’s when you feel pressure, that’s when you feel scared. Nervousness you’re gonna feel because you want to perform well. So I don’t think there is any added nervousness to this game. I think our guys are very well prepared and will continue to prepare mentally”. ***On new redshirt rules: That’s something they will save till the end of the year. Not looking to play them early. ***On Brandon Jones: “If there was an award for the most improved player out of spring ball, he would have gotten it”. He’s grown into his leadership position as well. 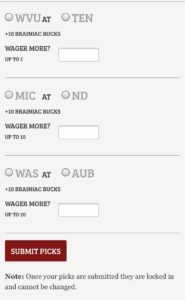 Last year we rolled out our “Pick Em” contest and it was well received! 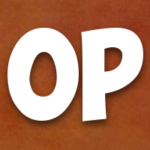 This year, in an effort to improve the contest, we have worked with our developer to provide an enhanced version of the contest which will allow a more user-friendly, and user-controlled opportunity to earn (or lose) your Brainiac Bucks. 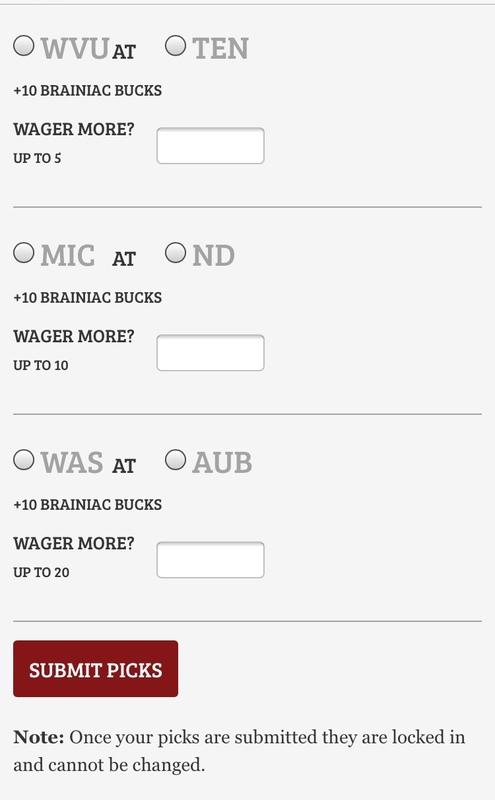 You can wager your Brainiac Bucks on as few or as many of the games you wish too! Later this season, you will have a chance to use those Brainiac Bucks in our Auctions for some really cool prizes! You can enter your picks for week one right up until Friday, August 31st at 11:59 p.m. If you are interested in playing the “TFB Pick’em Contest”, please click the Donor Board link!